Discover and celebrate the scholarly accomplishments, research, and innovations of D'Youville faculty and student researchers at this unique event. 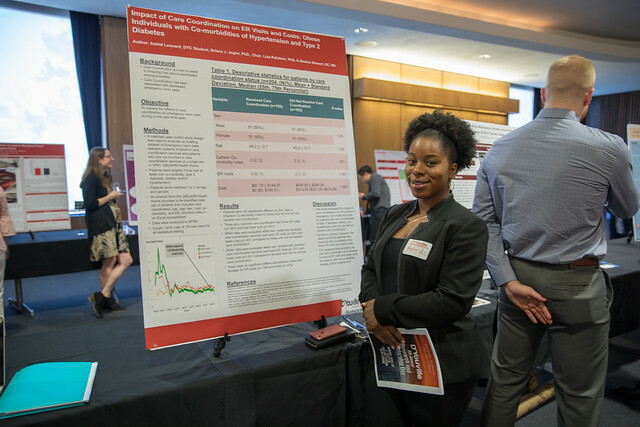 D'Youville's Research and Scholarship Day is an annual event held every April in which the D'Youville community comes together to explore the research done by faculty and students and award the most outstanding research in every category. The community is invited to attend and learn more about research at D'Youville and to interact with the researchers. Initiated in 2014, by Dr. Arup Sen, vice president of academic affairs, Research Day includes poster presentations selected by the dean of each school at D'Youville. Diverse topics are explored and participants are judged on the strength of their research and their presentation. Revisit the 2018 Research and Scholarship Day.